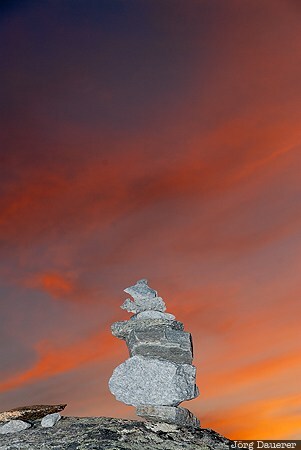 A typical cairn on the top of the mountain Dalsnibba in front of a colorful sunset sky partially illuminated by a flash gun (used as a fill flash). Dalsnibba near Geirangerfjord is in Moere og Romsdal in central Norway. This photo was taken in the evening of a sunny day in September of 2010. This photo was taken with a digital camera.